This review of the Pebble Time Round is for two sets of people: Pebble fans and the vast majority of us who would only wear a smartwatch if it doesn't look big or dorky. 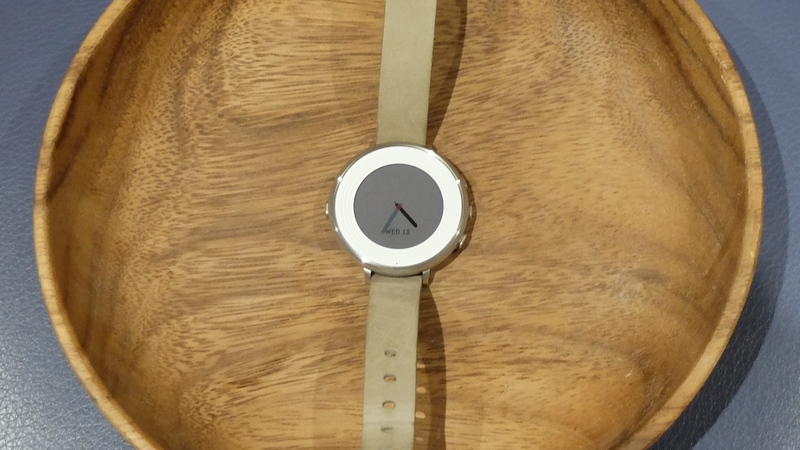 Pebble is actually going after that second category with its latest watch. Its first round smartwatch is stylish but not showy and truly 'wearable' in all senses of the word. But the fact that Pebble's signature, week long battery life has been sacrificed for a thin, light build means that this device might not suit those who have already splashed cash on a first or second gen smartwatch. Pebble hasn't quite cooked up the perfect blend of design, features and battery life. But this is a good indication of what's to come in future. And we like it. Everyone knows that Pebble smartwatches are geeky, retro looking pieces of wearable tech, right? All that changes with the Pebble Time Round which can look geek chic, yes, but it can also look preppy, classy, dainty or just plain watch-like. And damn, it's small and slim. When I first saw press pics of the Time Round, I did a double take, having worn fairly chunky, masculine Pebble devices over the course of the past few years. Now I have worn it for a couple of weeks, it doesn't disappoint. It weighs just 28g and is really comfortable to wear, you can move and shake your wrist around in a way that you can't with some more restricting smartwatches. It's just 7.5mm thick too, just look at it next to the 11.4mm thick Samsung Gear S2 (pictured below). That means it doesn't sit up too high on your wrist and will slip under shirt or cardigan sleeves without looking bulky. 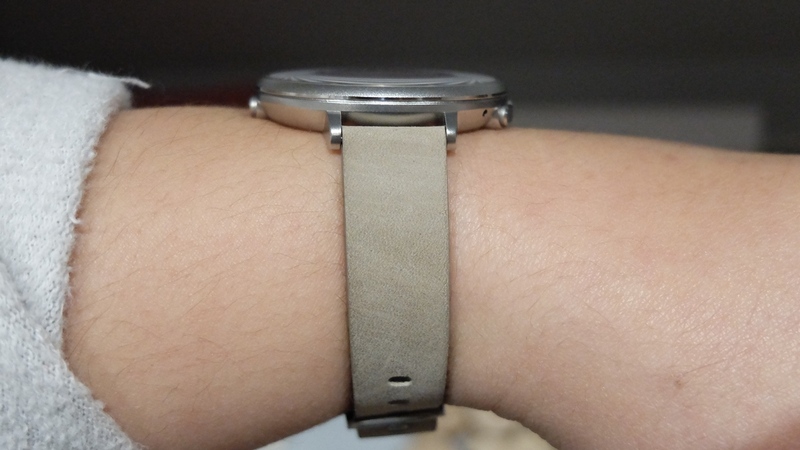 The result is that this is a truly unisex smartwatch. The black and silver models with leather straps and time markers - to make use of that big bezel - look utilitarian and masculine in a big city kind of way. The rose gold version (with a rose gold mesh strap), on the other hand, gives the new Moto 360 2 serious competition in the race to build the prettiest women's smartwatch. There are ten style combinations, with 14mm and 20mm straps in different materials, to choose from. It's worth noting that the Pebble Time Round starts at $249 euros and you will pay more for some of the more stylish models. Though, like Motorola, the range isn't extravagant with the most expensive option within of the starter price. One last point - all but two of the styles seem to be exclusive to Pebble.com. It's also a big leap for Pebble in terms of build quality, it's made from a light stainless steel that isn't as premium as on some rivals (or the expensive price suggests) but still feels well made and carefully finished from the now smaller lugs to the buttons. With the choice of straps, it's not surprising but the watch is only IPX7 splashproof compared to previous Pebbles that users could go swimming with. That might be a dealbreaker for some, in which case, look at buying a Pebble Time Steel. One more niggle - the (smaller) buttons are in the exact same place as previous Pebbles but as the body is now round, I found myself having to shift my hand more to make sure I was pressing the 'down' button. Only the button at two o'clock, and the 'back' button at nine o'clock are really suited to quick use. I can't stress enough how easy this smartwatch design is to live with, especially for women who find 2015's smartwatches too large, too chunky or too heavy to wear. It's comfortable all day, it's the only smartwatch I've considered wearing in bed for sleep tracking (via Misfit's app) and I don't find myself wanting to take it off when sat at my desk in the office or on arriving home as much as other smartwatches. That is a big win for Pebble. This is a small smartwatch and with it comes a small, round 1-inch display. 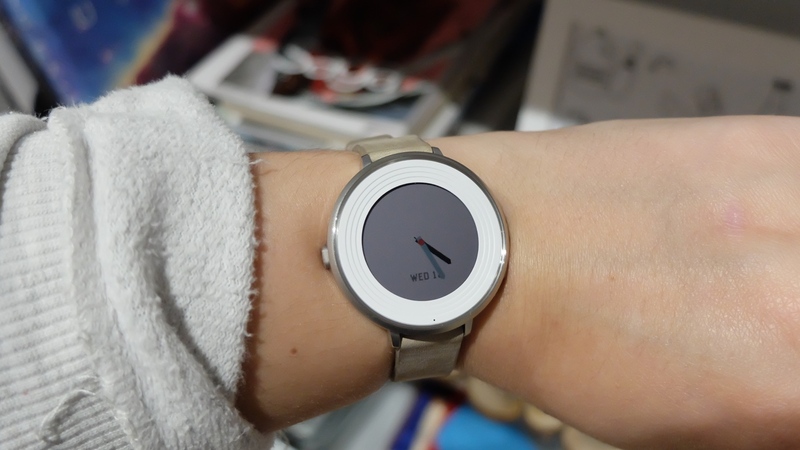 It actually feels even smaller as - in true Pebble style - the bezel around it is quite large. Depending on which watch face you pick, and whether you go for a model with marker details, you can style this out. It does help keep the Pebble Time Round discreet, though, so no-one is going to catch your Tinder or Grindr alerts popping up here, unless they are really squinting. In fact, I found myself having to closely at what was on the screen - indoors, the colour e-paper display can be tricky to see when the backlight has dimmed but outdoors - where I probably use it most, on the go - it works a treat. It is also covered in Gorilla Glass which is a bonus. The always on - yes, really - low res, not so vivid display is great for texts, alerts and apps now - it doesn't display images from WhatsApp yet, for example. And of course, it's the main reason we have a slim, light smartwatch with a two day battery life, none of Pebble's bigger rivals could have made this watch with an LCD or AMOLED. 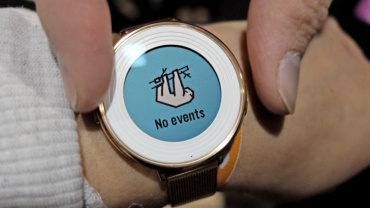 But with memes, GIFs and Vines heading for smartwatches, Pebble will have to give its screen tech another look in 2016. I'm not going to spend too much on the topic of how the Pebble Time Round is in use because there are no great changes to the Pebble experience. There's the same, handy Timeline feature to show you what's happening now, what you missed and what's coming up tomorrow. The UI has been tweaked for the round face, Pebble's quirky - albeit time wasting - animations are present and correct and it's still simple, easy to use and uncluttered. 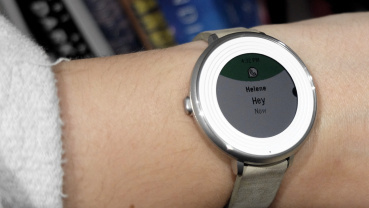 There's a few things that rivals do better - shortcuts and quickly turning off interruptions, say, but Pebble's watch faces were doing 'complications' before Apple and Android Wear even if they aren't quite as sophisticated. And while Google Voice is generally more accurate, even the new voice features which include replies on Android as well as dictation work well enough to actually use. It's also worth noting that if don't care so much about what the watch looks or feels like, from December, Pebble plans to roll out Timeline UI to the original Pebble and the Pebble Steel making them even more of a bargain. There's no GPS or token heart rate tracker. This isn't a fitness watch so aside from time telling, alerts, controls and other micro interactions, the Pebble won't double up as your sports watch aside from, say, Misfit step tracking. In terms of upcoming features, we can already expect a contactless payment Smartstrap for 2016 as well as other functions arriving via Pebble's modular accessory program for the Time series of its watches. I said you get the full Pebble experience on the Time Round, that's not quite true. If you already own a Pebble, you will find yourself with apps and watch faces in your locker which are not compatible with your new watch. And if you are a newbie you are, at least for the time being, getting access to only a portion of the apps and watch faces created for Pebble. We found about 150 apps and around 400 watch faces available for the Time Round so far and in terms of what we had previously downloaded, it was about half and half in terms of compatibility with this device. Some big names are already on Round - Uber, Misfit, Swarm - while others like ESPN, Jawbone and TripAdvisor haven't put the effort in yet. We expect this to improve as Pebble has been working to get the Time Round's apps up to scratch but we'll revisit this in a couple of months. 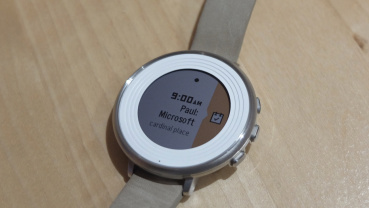 In terms of Pebble's own community, particularly watch faces, this is less of a problem. Pebble devs even convert colour watch faces back to black and white so it's likely they will support this new, more mainstream device just as faithfully. There's a new section for voice apps on Pebble's app store but it's the watch faces that Pebble users love trying out regularly. This selection is fairly well stocked considering the Time Round only went on sale earlier this month and is quick to react to topical events - a rash of Halloween watch faces gives way for Paris/peace symbol watch faces, for instance. Either you will hate the idea of charging your Pebble Time Round every two and a half days, which is what I routinely got out of it, or you won't care. For many people, with both the Apple Watch and Android Wear offering slightly shorter gaps between charges, it's a pretty good deal considering the style and features here. If you want a bright, sharp display though you can get a day and a half/two days out of a few Wear watches now, though, so it's worth considering. Everyone has a different limit when it comes to charging an accessory on top of charging your phone. A couple of points in Pebble's defence. The quick charging really is quick with 15 minutes giving us about 60% and 30 minutes getting it to a full two days use again. The charger is the same as the Pebble Time and we could see third party Smartstraps by next year, some of which plan to beef up that battery life. Again, right now the option is there to go for a Pebble Time Steel. Hopefully in 2016 we won't have to choose between looks and specs. Purely on the basis of the battery life and the (so far) limited number of apps, the Pebble Time Round won’t be for everyone. But no smartwatch is. What matters is that Pebble has proved that it has the design chops to add to its terrifically simple OS and enthusiastic community of developers and users. This is a must have for women put off by smartwatches and, for that matter, anyone looking for a helpful, always on, no fuss device that fits into your life and under your shirt sleeves.